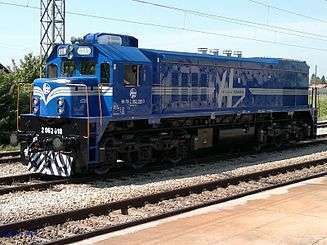 Croatian Railways (Croatian: Hrvatske željeznice, HŽ) is the national railway company of Croatia. Croatia is a member of the International Union of Railways (UIC). The UIC Country Code for Croatia is 78. The Croatian railway system consists of 2,974 km of rails (of which 248 km is double track). 1,228 km of track (41.3% of the network) is electrified. (End of 2004). 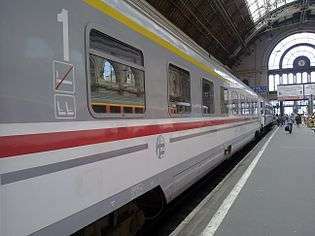 There are other routes to Slovenia, Hungary, Bosnia and Herzegovina and Serbia, as well as regular overnight trains to Austria and Germany (namely Bavaria). 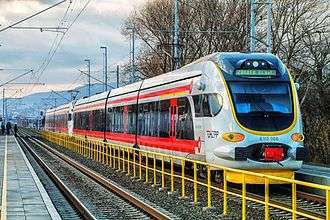 The network enjoyed a limited number of improvements in the 2000s, such as an increase in the maximum speed of the Zagreb-Novska-Vinkovci line: certain sections of the route have had witnessed a rise in maximum speed from 80 km/h to 160 km/h. Railway modernisation is set to be extended further, and a national 'railway investment plan' (with funding totalling over 18 billion HRK through 2012) was announced; following the 2008-09 financial crisis, however, the plan has yet to come to fruition. A regional train making way for an Inter-City tilting train on the Zagreb-Split line. At Vinkovci, lines extend towards Županja and Vukovar, both unelectrified. The connection towards Osijek was severely damaged in the Croatian War of Independence. Repairs began in 2003 and in December 2008 the line was fully reopened. The Ogulin–Knin line, also known as the "Lička pruga" (en. "the Lika line") is part of the railway connection between Zagreb and Split. As of 2007, this line is being heavily upgraded with many sharp bends and grades removed in order to allow tilting trains to travel at nearly full speed on most parts of the track. Reducing travel time from Split to Zagreb by around a third, to 5–6 hours. This track was not intended as the shortest distance between Zagreb and Split. The line via Martin Brod which forms the border with Bosnia, has not been reopened to passenger traffic since the wars of the 1990s. Some of the problems faced include the age of the line; it was constructed in the mid-1900s and contained many curves, often in difficult terrain. Services were slow and speeds severely restricted. The modernisation has involved rebuilding entire sections of track, straightening many curvy segments by rerouting portions of the track and renewing the rails, leading to higher operational speeds. Electrification of the line is not scheduled for the near future. Numerous stations along the line that were in the area of Serbian military occupation have been abandoned. Local trains are only functioning between Ogulin-Vrhovine (two per day). From Vrhovine to Knin there is as of 2013 no local passenger transport, even though some stations are in good condition (e.g. Medak, Malovan, Plavno). 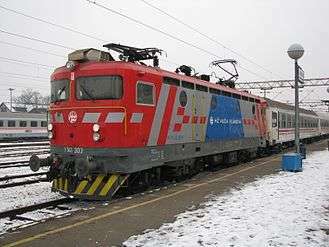 ICN tilting trains only stop in Gospić and Gračac. Some stations are to soon be renovated or rebuilt (Lovinac, Gospic); Croatian Railways, however, currently have no plants to restart local passenger transport. In late September 2014 HŽ Putnički prijevoz abandoned the night train 824/825 between Zagreb and Split. The fifth Pan-European corridor has two branches in Croatia, the "b" and "c" branch. Corridor Vb enters Croatia in Botovo, and runs to Zagreb. The part from Zagreb to Rijeka should become part of this corridor, as soon as the extension towards Rijeka is built. Corridor Vc is a Pan-European railway line, running north to south within Croatia. It enters Croatia at Beli Manastir on the border with Hungary, and runs through Osijek to enter Bosnia and Herzegovina in Slavonski Šamac. It enters Croatia again in Metković, in the very south-east of Dalmatia, where it ends at the Ploče harbour. The line crosses the Dobova-Tovarnik line in Strizivojna–Vrpolje. The line is currently being heavily modernised in order to revitalise Ploče's harbour. The part from Strizivojna-Vrpolje towards Slavonski Šamac is fully electrified, and recently the modernised catenary has been put into operation. The passenger traffic scheduled from Vinkovci to Slavonski Šamac (now performed by electrical power) is still fragmented. 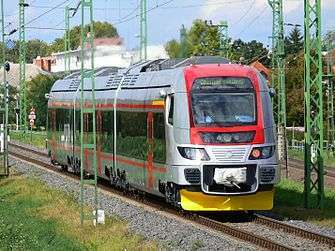 The remaining part from Strizivojna-Vrpolje to region of Osijek (heart of the region Slavonia) is scheduled to be electrified, as soon the general overhaul of the line track is completed, after which operating speeds will finally be raised to 160 km/h (100 mph). The line will stay single track. Before the dissolution of Yugoslavia, the Vinkovci-Osijek line was one of the busiest branch lines of Croatia, linking two regional centres. At the time the line allowed speeds of up to 120 km/h. As a result of the war, only about 10 kilometres of the 35-km line remained intact. Most of the track was dismantled by invading Serb forces, both in the form of vandalism as well as to use the materials in barricades. The reconstruction of this vital route was finally finished in 2008, and today the route is once again fully operational. Test runs with a measuring vehicle were successful, and speeds reaching 80 km/h were attained. The first test train had its maiden voyage along the route on 12 December 2008, and regular revenue service restarted two days later, on 14 December. The route called Unska pruga (lit. the Una track) that connects Zagreb and Split along the Una river valley was once an integral part of the Yugoslav Railways railway system. Today, this route remains largely unused, since much of the route virtually runs over the border between Croatia and Bosnia and Herzegovina, crossing it multiple times, on the section between Knin and Bihać. Although this route is largely well preserved and electrified at 25 kV/50 Hz (making it compatible with the Croatian electrification system), administrative problems concerning the many border crossings cause this route to be used only for limited freight traffic services. The designated border crossing along the line between the two countries is at the town of Martin Brod. There are some rail network connection problems, which have historical causes. When Croatia was part of Yugoslavia, the rail network was consistently connected and managed by Yugoslav Railways. As the Yugoslav constituent states demerged, important rail links were severed. Istria has no direct connection through Croatia. Currently, all rail operates through Slovenia, though this is planned to be solved with a tunnel north of Rijeka. The Dubrovnik area is again a special case. Dubrovnik and its surrounds are an exclave, divided by the small Neum corridor belonging to Bosnia and Herzegovina. Historically, the Dubrovnik region has been developed through sea travel. There has never been a direct rail link through Croatia to Dubrovnik, and none is planned in the future. A large 760mm narrow-gauge rail network was constructed in the early 20th century, when the Kingdom of Dalmatia as well as Bosnia and Herzegovina were under Austrian control. The rail route to Dubrovnik went from Sarajevo via Mostar and Čapljina rather than to Split and Zagreb in Croatia. In 1967 the line from Sarajevo to Čapljina was upgraded to standard gauge, and from there extended not to Dubrovnik but to terminate at the nearby Port of Ploče, handling freight via Bosnia. The route from Čapljina to Dubrovnik was closed in 1975 by the Yugoslav Government, acting on the advice of foreign transport consultants. This was in spite of the attractive scenery of the route which has been compared to Switzerland's narrow gauge network. Proposals in 1985 to reopen the route were unsuccessful. Direct trains connect Zagreb with Ploče in thirteen hours, via Bosnia and Herzegovina. The road connection from Ploče to Dubrovnik is 100 km (62 mi) and passes through Neum. The original decision in former Yugoslavia was to use 3 kV DC electrification for the railway network. This was performed on the Rijeka–Zagreb line, which due to the mountainous Gorski kotar region had a need for more powerful trains than the traditional diesel powered ones. Beginning with the modernisation of the Zagreb–Belgrade railway line an electrification system of 25 kV/50 Hz was used. Electrification on other lines in Croatia was then made exclusively 25 kV/50 Hz. Later, the majority of the Zagreb–Rijeka line was re-electrified to 25 kV/50 Hz, but until December 2012 there was still a part that under 3 kV DC. Consequentially a power system break existed at Moravice. HŽ was considering the purchase of dual-voltage locomotives, as an alternative to full re-electrification of 3 kV DC tracks, but the idea was scrapped for good as all electrified railways in Croatia are now using 25 kV/50 Hz. All railway power systems in Croatia are exclusively of type overhead catenary. Due to lack of passenger train-sets, sometimes some endorsed classes are still used, like 7021.0 (two left) and 7221.0 (as branch-line or backup train-sets). In 2004, 8 modern Bombardier RegioSwinger tilting trains called "ICN" (short for InterCity Nagibni; Tilting InterCity) from the German branch of Bombardier Transportation were delivered to Croatian Railways. These trains are normally deployed on the mountainous route between the two largest Croatian cities, route Zagreb - Split, but are also sometimes on the InterCity routes in the continental part of the country. In the case of the Zagreb-Split route, this offers passengers a much more comfortable and time-saving journey with regard to previous trains whose journey took 8 hours, whereas the tilting trains take less than 5 and a half hours, and are more quiet and better equipped as well. However, the safety of the tilting trains and their possible technical incompatibility with the conditions of the Croatian railroads are disputed after the 2009 Rudine train derailment, an incident that occurred on 24 July of that year, in which six passengers were killed and 55 were injured in the crash. Approximately 3 years before this fatal derailment, on 24 November 2006, there was another accident in which the train's engineer was killed; the tilting train crashed into a lorry at a railroad crossing that had no ramp or warning lights. Out of eight trainsets that were introduced in 2004, two are therefore out of service. The tilting train services may therefore have to be reduced as there are no longer enough train-sets to serve all scheduled ICN trains and destinations. In 1993 HŽ renumbered all their vehicles. This results in some confusion to the relation to their previous numbers. All other companies, which have been formed after dissolution of JŽ have kept the original numbers. The current rail speed record in Croatia is 185 km/h. The record was set on the line between Novska and Nova Gradiška. The run was performed in order to demonstrate the possibilities offered by the Rade Končar built JŽ 442 electric locomotive class (now HŽ1142 train class). Despite being over 25 years old the 1 142 remains the fastest locomotive in operation with Croatian railways. Building a new line between Bjelovar and Zagreb (Railway line Gradec-Sveti Ivan Žabno). Suburban rail traffic around Zagreb is to be fully renovated and reorganised. Some local lines previously shut down will be reactivated, and a link to Zagreb Airport has been approved and announced by Zagreb authorities. New EMUs and DMUs have been ordered from Croatian manufacturer Končar KEV. Corridor 5c will be upgraded to allow an operating speed of 160 km/h. This has already been completed between Osijek and Slavonski Šamac. Dual power engines will be purchased. Some tests with trains from various manufacturers, mostly Siemens Eurosprinter electric engines, have been performed already. Revitalisation of the Osijek-Vinkovci line recently started, and the line will support maximum speeds of 120 km/h (100 km/h in practice). Since this line was in a badly damaged state the reconstruction will be done in 2 phases. Phase 1 is only the necessary signalling (track crossing signalling through traffic signs only). Due to this fact and the current corresponding Croatian laws, traffic must commence very carefully, and probably trains will have to stop on every crossing and then speed up again. Due to excess costs in phase 1, phase 2 will be deploy automatic track-road protection devices on all crossings, which will finally allow full nominal line speed. A fully electrified line connects Rijeka with Zagreb, onwards towards Koprivnica and the Hungarian border; the railway line forms part of the European 5b corridor. A transportation bill to be passed by the Croatian Parliament will see the start of construction of Croatia's first high-speed rail line along this pan-European corridor, enabling theoretical speeds of between 200 and 250 km/h with an average journey speed of no less than 160 km/h. The plan consists of retrofitting the existing track between the Hungarian border and Karlovac to a double-track configuration, as well as constructing new tracks along an entirely new alignment from Karlovac to Rijeka. The line's complete length will be 269 km, or 61 km shorter than the current line. Construction on the new line was announced to start in the autumn of 2008 and was to be completed before the end of 2013. The onset of the economic downturn of the late 2000s has put this project on indefinite hold. The speeds of this line will enable a trip from Rijeka to Zagreb in an hour, as opposed to the current four hours. The initial route plan is described on this link: Initial proposed solution. The line is conceived primarily to better connect the Port of Rijeka to the network of European transport, as the port serves many regions and locales across Central Europe. More usage of the flagship ICN trains (the newest HŽ stock acquisition), also on Zagreb-Našice line (over Nova Kapela-Batrina and Pleternica), additionally to currently running Zagreb-Osijek over Strizivojna-Vrpolje train and to Varaždin. This is the latest news, as announced. Ridership on existing ICN lines proved to be full success. The ICN Zagreb-Osijek, Zagreb-Varaždin and Zagreb-Split ICN lines are almost always at 100% ridership capacity. Reelectrification and bringing back the destroyed catenary and signals on Novska-Sisak and integration in the full pre-war length and conversion to former known Zagreb-Novska alternative route, also speed increase. 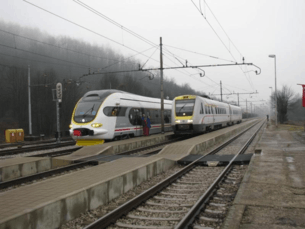 A new, just few kilometers long connection route (branch line) connecting two rail routes around Bjelovar is planned a long time, and, when build, will shorten travel times from Bjelovar to Zagreb (now done over Križevci). This will be the first entirely original railroad line in Croatia in many years. Plans to upgrade the Dobova-Tovarnik (Corridor X) to double track at the full length (if the freight traffic increases to pre-war amounts or above that) and higher speeds (above 160 km/h) (talked about since long time). Most of the track damaged sections between Novska and Tovarnik is completely renewed after the Croatian war of independence. This route is the most probable candidate for a track above 200 km/h in the current status, as it is the most modern route, and double track in mostly excellent condition exists currently between shortly before Zagreb and Dugo Selo, and between Novska and Vinkovci. The part of double track existing after Vinkovci to Tovarnik is still being reconstructed, though only one track is currently functioning at reduced speed. This route is protected by security systems (St. Andrew's crosses and ramps) in the whole length. Near Zagreb, and Vinkovci there are even fully separate level crossings with roads. The rest is also mostly separate level crossing. Only the signalling system and overhead catenary would need some adaptations. The Osijek-Vinkovci line is planned to be electrified after reopening, if justified. Before the war related closure and heavy damage in 1991, it was one of few profitable branch lines. With new changed circumstances (this is now a direct and shortest connection between European corridor Vc and corridor X), it would be economically justified to electrify it, as shortest link between the two corridors towards eastern Europe. Sisak-Kutina-(Lipovljani), a new short highcapacity railway stretch for the speed of 250 km/h. This will be a link between the corridor X branches over Sisak and Kutina. HŽ Vuča Vlakova accumulated substantial debts; in August 2012, it was announced that it would be broken up, with locomotives allocated to the freight and passenger divisions. ↑ "Kreće obnova pruge Vinkovci - Osijek" (in Croatian). Jutarnji list. 22 January 2007. Retrieved 2 March 2012. ↑ "A SHORT HISTORY OF THE RAILWAYS IN DALMATIA 1876-2007". Archived from the original on 7 October 2008. Retrieved 31 May 2010. ↑ "Dubrovnik to Sarajevo in 1965 by Charlie Lewis - Page 1". Retrieved 31 May 2010. ↑ "Dubrovnik to Sarajevo in 1965 by Charlie Lewis - Page 2". Retrieved 31 May 2010. ↑ "From Sarajevo to Dubrovnik in 1967 by Dave Sallery - Page 1". Retrieved 31 May 2010. ↑ "Nagibni vlak kod Kaštela iskočio iz tračnica: Za nesreću krivo protupožarno sredstvo?". Index.hr. 2009-07-24. Retrieved 2012-03-02. ↑ "U sudaru HŽ-ovog vlaka i kamiona poginuo strojovođa - Vijesti.net". Index.hr. 2006-11-24. Retrieved 2011-05-03. ↑ "New projects in Croatian Infrastructure" (PDF). Pfaffrail.googlepages.com. Retrieved 2011-05-03. ↑ "Croatia Railways' restructuring". Retrieved 19 August 2012. ↑ "News in Brief - August 2012 - Railway Gazette". Railway Gazette International. Retrieved 19 August 2012. Wikimedia Commons has media related to Croatian Railways.